Features (or rows) in your GIS identified as not meeting data quality requirements are stored as a Reviewer result. Results are created when using the Data Reviewer automated and semiautomated tools within your quality control workflow and include metadata describing the issue and, optionally, a geometry. For example, results are automatically created when using the Execute Reviewer Batch Job geoprocessing tool to automate data validation based on business rules implemented with Data Reviewer batch jobs. Data Reviewer tools—such as those found in ArcMap (Flag Missing Feature and Commit to Reviewer Table tool) and ArcGIS Server (writeResult/writeFeatureAsResult operation)—capture results based on semiautomated processes such as visual review. Review phase—Result is awaiting further review after discovery. Correction phase—Result has been addressed either through corrective editing of the related feature or marked as an exception. 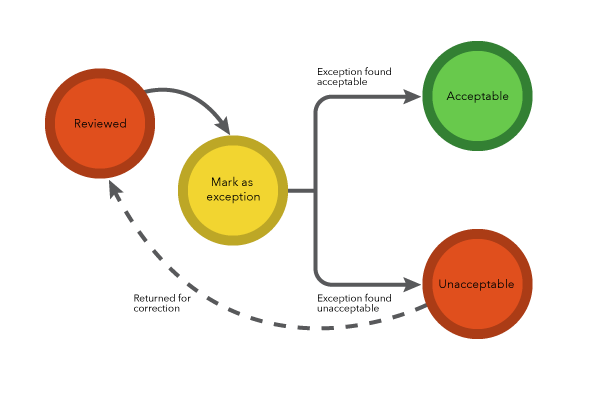 Verification phase—Actions performed on the related feature are acceptable or the feature should be considered an exception. Ideally, a result moves through each phase where it's reviewed and acted upon by multiple participants in the correction process. For example, a customer using a web app identifies an issue with a feature and reports it as a Reviewer result using web-based tools. As an identified result, it appears in the Reviewer Results pane (ArcGIS Pro) or Reviewer Table (ArcMap in ArcGIS Desktop) in the Review phase. During the Correction phase, a technician assesses the issue and resolves it either by correcting the feature using tools found in ArcGIS Desktop or marking it as an exception. While in the Verification phase, an analyst assesses how the issue was resolved to determine whether the action is acceptable or unacceptable. Issues that are determined to have been resolved in an unacceptable manner are returned to the Review phase for additional work. Results are managed using ArcMap, ArcGIS Pro, or ArcGIS Server. Results that identify errors in your GIS follow a 3-phase workflow that enables tracking of correction and verification tasks. Information collected during this workflow aides in communicating how the error was corrected, who corrected and verified the error, and when the correction and verification was completed. A result in Review phase is awaiting evaluation to determine what (if any) corrective action is required. Corrective action taken to resolve the issue (as described in the Correction Notes). Results marked as an exception case. A result in the Correction phase has been resolved either through a corrective action or marked as an exception. Results that are automatically verified using tools in ArcGIS Desktop are assigned a default Status for the Verification phase; a result with the status of Resolved during the Correction phase will progress to Acceptable, and a result with the status Mark as Exception will progress to Exception. A result in the Verification phase means that it has completed the Data Reviewer quality control workflow. The result has successfully been reviewed, corrected, and verified. Results assigned a custom verification status prior to the 10.3 release will have a status of Unknown. Exceptions are typically discovered during the Correction phase. These are features that may be discovered as the result of an automated check or visual review and initially thought to be an error; however, during correction they are determined to be acceptable and not needing correction. Marking a result that originated from an automated check as an exception ensures that the feature is not written as a new result in the future. It is important not to delete these results; mark them as exceptions to prevent duplicate results from being created during automated review. Sampling is a technique used in data quality assessment when it's impractical to individually review all features in your GIS. Sampling results are created using the Sampling Check and follow a shortened life cycle workflow. Sampling results are an exception to the standard three phase life cycle process (Review, Correction, Verification) due to the unique role they serve in assessing data quality in semiautomated workflows. A sampling result's initial life cycle phase is Review with a status of New. Sampling results move directly from the Review phase to the Verification phase. 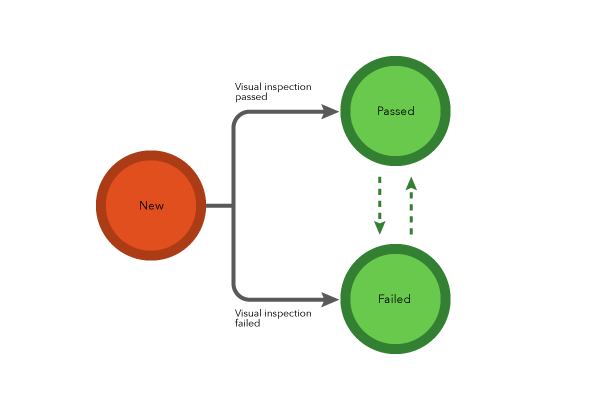 After a sampling result has passed the Review phase, it progresses to the Verification phase with possible life cycle status values of Pass or Fail.